Some Warriors fans have better things to do than worry about Draymond’s fouls or Steph’s three-point percentage. Felicia Wallace, for instance, keeps her eyes glued to the turnstiles at the BART Coliseum Station. She’s a veteran station agent, part of a vast network of working people who feed, transport, guide, watch over, serve drinks to, suffer through losses with and otherwise tend to the needs of a surging, rollicking Warriors Nation in the postseason. They’re fans, but only to a point. Like the TV networks, they discreetly root against a Warriors sweep in order to prolong the series and maybe earn a bigger payday. Almost none of them can afford a ticket to actually watch a game. And most are happy to make the occasional Cavaliers fan feel welcome — especially if they behave themselves and leave a decent tip. “Oh man, I just love being the only Cavaliers fan here,” shouted one 28-year-old Cleveland fan, Johnson Solomon, who was drowning his sorrows after Game One in a sea of Warriordom at a San Francisco watering hole called the Tempest. In the BART station outside the Warriors hometown venue, game nights can quickly turn into a mess if not for the watchful eyes of Wallace and her skilled teammates. She takes her post inside a Plexiglas booth, her uniform decorated in blue-and-gold pins, basketball cards of players taped to the walls. “Oh, I’m a diehard fan,” she says, praising not only the team, but the general level-headedness she sees in the Golden State fan base passing by her window. Ridership doubles on big game nights, and these game nights are the biggest of the year. About 3,500 more people than usual will be moving through the turnstiles when the Warriors are in town. It only seems like all 3,500 are trying to get through the same gate at once. Balky tickets are the biggest problem. After-game crowds, while rowdy and often thoroughly lubricated, rarely cause serious troubles. Besides being a remarkable basketball team, the Warriors are also an economic engine and important source of jobs. Right now, the jobs can be found on both sides of the bay. By Game Three, the Warriors were on to Cleveland, up 2-0 in the best-of-seven contest, and the Oakland Arena was deserted at least for a few days. 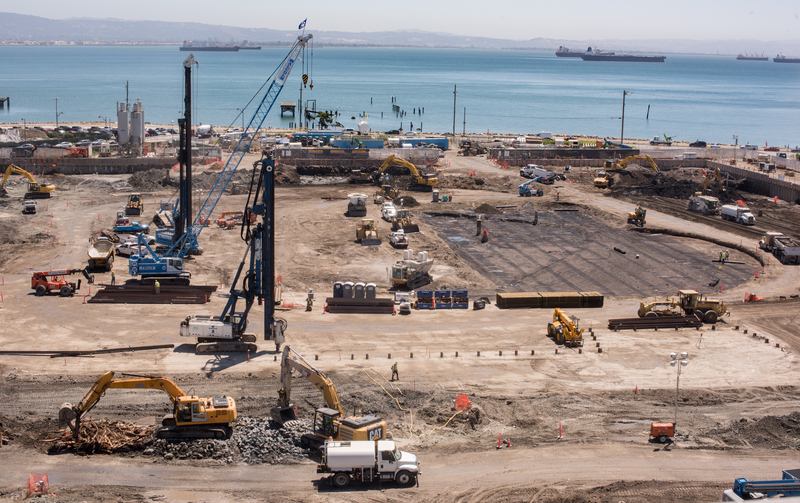 But across the bay, it’s a busy scene at the Mission Bay site where the team broke ground on its new San Francisco arena in January, with Kevin Durant using a golden shovel to turn the first bits of ceremonial rubble. These days, the new Chase Center is a four-block-sized gathering of ironworkers, dirt movers, traffic controllers, welders and other trades. They expect to be finished in time for the 2019-2020 season opener. Chase Center will create 2,500 short-term construction jobs and 3,000 permanent jobs, generating “millions of dollars in new economic growth and activity for the city,” according to the Mayor’s Office of Economic and Workforce Development. Patrick Tobias, 52, landed one of those construction jobs, working 50-hour weeks as a laborer. He stood in his white hardhat on a break recently, watching the container ships out on the bay. Patrick Tobias, a Chase Center stadium construction worker, takes a break in front of the central basin of the San Francisco Bay on June 2, 2017. Tobias says he feels good about being a part of the construction process and is a fan of the Golden State Warriors. Photo by Julio Marcial/Bay News Rising. When he lit a Newport menthol, the smoke mixed with the smell of wet cement. He recalled with pride trucking in mountains of sand, day and night, to fill the site of AT&T Park, where the Giants play their home games just up Third Street. He also had a hand in building Muni’s T-Line, the light rail that runs down Third Street outside both the Giants ballpark at China Basin and the new basketball temple taking shape at Mission Bay. He counts himself a fan of Kevin Durant and hopes to snag some tickets somehow with the pro connections he’s made. Besides the pay and perks, however, there’s a deeper reward for work on a project like the Chase Center or AT&T Park: Tobias views it as a way to leave a mark on the city, an achievement of a lifetime for many workers. Tobias, born and raised in San Francisco, wears it with the pride of a championship ring. Local governments are famous for puffing up claims of economic benefit from sports venues. In San Francisco, that debate has been muted to some degree because the new arena is mostly being privately financed. The biggest clash over the Chase Center involved its close proximity to UCSF’s new hospital at Mission Bay, and the need for ambulances to get around amid the crowds of sports fans. That squabble was resolved. At the same time, few observers argue that the Giants stadium built a decade ago, has been anything short of a smash hit, transforming China Basin into a center of SoMA nightlife. Now, community boosters hope the economic wheels keep turning as the action moves to the south. A city-financed study in 2015 by Keyser Marston Associates estimated that Chase Arena will produce at least $14 million a year in new tax revenue for San Francisco. The city’s gain, however, could mean a loss someplace else. 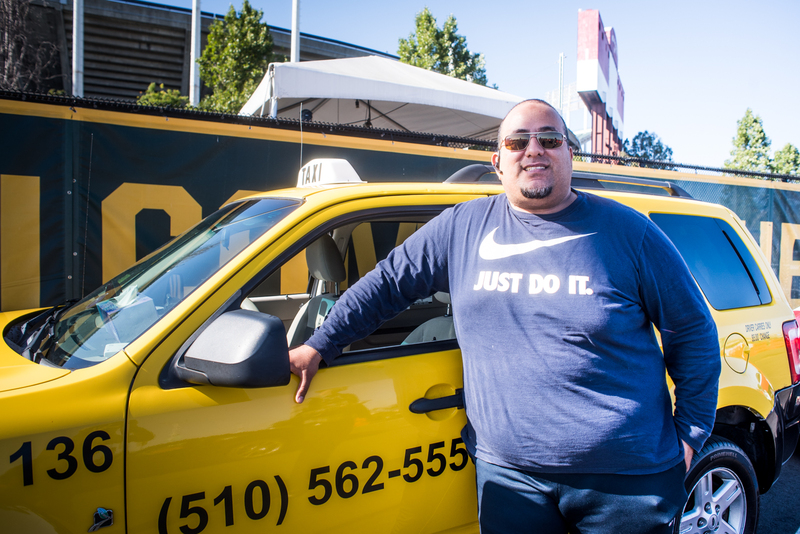 Ehab Elsayed, 40, a longtime shuttle-bus driver who started driving a cab last year, figures he may be among those looking for other ways to earn a living once the Warriors pull out of Oakland. He stood by his cab at the Oracle Arena on the first night of the NBA finals, the din of elated Warriors fans just audible as Cleveland went down without much of a fight. Elsayed figures it’s all but over for game-night sports business in the East Bay. Not only are the Warriors packing up, but so too are the Raiders, who are headed to Las Vegas. The A’s, starved for attendance, have eyed Fremont and San Jose, but don’t seem to be going anywhere just yet. “We won’t be coming here for nothing. We’re done,” Elsayed said. Salvador Esparza, 31, recalls being a Warriors fan back when everybody seemed to be rooting for the Lakers. Now, he drives for Uber, whose app lures drivers with 50 percent higher fares to cover Warrior surges. Still, Esparza shuns the snarled streets at tip-off time around the arena. “The traffic is terrible, it’s not organized at all, everyone is trying to get out and you are trying to get back in. People get mad,” he said, adding that he much prefers ferrying passengers to and from Oakland International Airport. 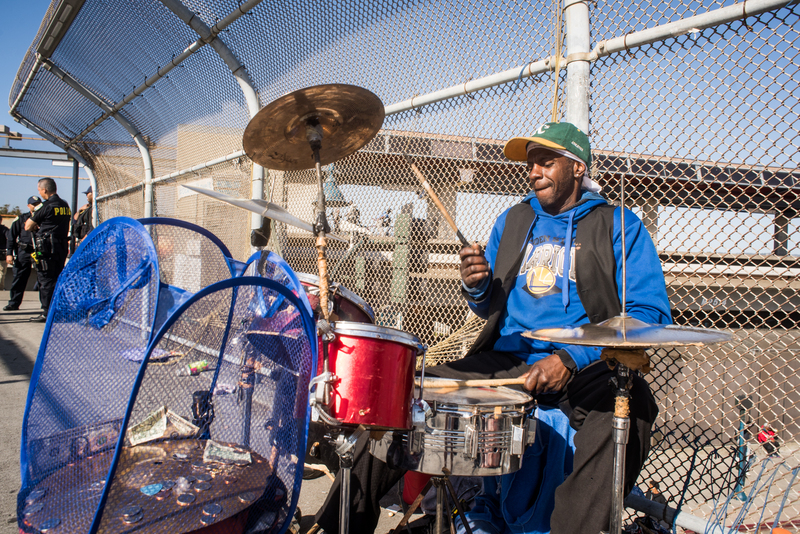 Workers such as Devon Black, a 40-year-old security guard who has been working Golden State arena crowds in Oakland for the team’s three-year championship run, figures he will just commute to the west side of the bay when the time comes. He said he can afford the extra few dollars in BART fare. His biggest complaint was the high cost of tickets to watch the Warriors play on his off nights. Although the Warriors support system may be a working class affair, it’s a well-heeled scene in the seats. Golden State is ranked the fourth-costliest ticket in the NBA at an average $79.84 a seat, trailing only the Chicago Bulls ($82.33), Los Angeles Lakers ($103.27) and New York Knicks ($129.38). For the 2017 finals, the first game in Oakland wound up costing fans on average $1,850.30 a ticket in the online market, according to one published report. Should there be a Game Seven, the asking price could double. Or it could go to the moon. Nobody who works security for a living will be going along for that ride. Yet he still counts himself among the Golden State faithful. He figures he’d have to save for a year to take his son to a game, but even then, he still talked about splurging a few extra bucks to get the kid some Warriors memorabilia. So he returned to his post, and got back to work. This entry was posted on June 7, 2017 by Bay News Rising and tagged bluecollarworkers, chasecenter, goldenstatewarriors, kevindurant, labor, locals, NBA, nbafinals, Oakland, oracleareana, sanfrancisco, stephcurry, workingwarriors.